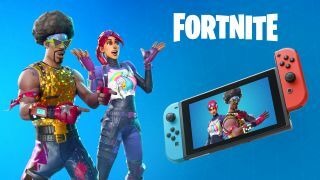 Starting September 18, you'll need a Nintendo Switch Online Service subscription to play the multiplayer modes of many Switch games, but Fortnite won't be one of them. An FAQ page on Nintendo's official support site confirms the detail, which was suggested but not put in such official terms before, meaning Switch owners can keep playing one of the best free games out there for Actually Free into the foreseeable future. Nintendo's support page explains that games like Splatoon 2, Mario Kart 8 Deluxe, and Super Smash Bros. Ultimate (once it comes out) will all require a subscription to participate in their online multiplayer components as of September 18. Always a bummer to have to pay for something you got for free before, but hey, Nintendo's been upfront about these plans since before Switch even came out. But here's the relevant line for royale battlers now and going forward: "Some games, such as Fortnite, can be played online without a Nintendo Switch membership." Only Fortnite is specified as an exception, but I'd hazard a guess to say that other free-to-play games like Paladins and the upcoming Warframe Switch version, now set to arrive on November 20, will likely also be exempt. That would bring the Nintendo Switch Online Service closer to parity with Sony's PlayStation Network, which similarly charges for online play except in the case of free-to-play games. Microsoft's Xbox Live stipulates that all online multiplayer games require a Xbox Live Gold membership regardless of whether you have to pay from them up front. Feature comparisons aside, a full-year membership to Switch online costs just a third of PlayStation Plus or Xbox Live Gold, which is pretty nice. On the other hand, at least Switch and Xbox One players can squad up and go for Victory Royale together - here's how to enable cross-platform Fortnite matches.